The Reading, Blue Mountain and Northern is unique among short line and regional railroads in a number of ways, primarily having to do with the unconventional business approach of the company’s owner, Andy Muller, Jr. The northeastern Pennsylvania railroad, whose primary cash cow is hauling anthracite coal between mines and interchange points with Class I railroads, has also offered a fair amount of seasonal, excursion passenger service over its entire network. In addition to regular 10-mile round-trip weekend runs out of Jim Thorpe, PA through the Lehigh River Gorge, it also has an operating steam locomotive, a variety of passenger cars, and two recently restored Budd Rail Diesel Cars. These run several times a year on different parts of the Reading/Pottsville-Jim Thorpe-Pittston/Scranton main line and are marketed, along with the Lehigh Gorge trips, under the moniker Lehigh Gorge Scenic Railway. Muller has plans to build upon these foundations and offer regularly scheduled (albeit less-than-daily and seasonal) passenger service over more of the line. Reading & Northern Chairman Andy Muller Jr. operates a two-car Budd RDC train in excursion service on his own railroad between Port Clinton and Tamaqua, PA. Photo by Malcolm Kenton. I made a trip to Pottsville last November to ride what was going to be the first public trip of the RDCs (they were sidelined due to mechanical problems and replaced with diesel-hauled heavyweight commuter coaches) between there and Reading, with a two-hour layover stop in Port Clinton to tour the company’s headquarters and main locomotive and passenger car shops. I was impressed with the operation and with the condition of the tracks and the historic depots in many cities on the line. When the railroad announced that the RDCs would be making several weekend runs this summer between Pottsville and Jim Thorpe, a friend and I did not hesitate to book tickets and make arrangements to ride two weeks ago. Our trip, along with each of the two previous RDC trips, was sold out, and all the passengers were in good spirits in spite of the oppressive heat and humidity (the RDCs are not air conditioned, but have open windows). The ride took three hours in each direction, keeping a swift pace of 40 mph most of the way, mostly on track where aging jointed rail was recently replaced with continuously welded rail, and we were given four hours to explore the charming, historic village of Jim Thorpe and take the 1:00 one-hour round-trip Lehigh Gorge excursion. On the ride over, I walked to the forward cab, where two fellow passengers were chatting with the engineer as he piloted the two-car train down a winding track hugging the Little Schuylkill River. The engineer was none other than Andy Muller Jr.
Muller told me that, based on the success of his RDC trips so far, he felt he could make money by running RDCs every Saturday and Sunday from May through November between Reading (a much larger and more easily accessible city than Pottsville) and Jim Thorpe. He will soon start work on converting 2.25 acres along the RBMN line in North Reading into what he called “Andyland,” a miniature Disney World with a full-service depot and other amenities and attractions, but he will not wait for that project to finish before starting regular service from a temporary station next spring. Muller described his target demographic for these trips as middle-aged people and seniors, particularly women, from the eastern Pennsylvania area who might be interested in taking a charter bus tour to a place like Jim Thorpe, or to tour the Yuengling brewery in Pottsville, or to tour an anthracite mine. 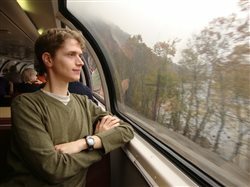 He plans to woo them by offering a higher-quality experience than a bus for a similar, affordable price. Two-car Reading & Northern Budd RDC train at the historic Jim Thorpe, PA depot. Photo by Malcolm Kenton. I also suggested to Muller the idea of partnering with Bieber Tourways, which operates intercity motorcoach service between Philadelphia and Pottsville, with stops at Norristown, Pottstown, Reading and Schuylkill Haven. If Bieber’s schedules and route were adjusted so that the buses connected with RBMN trains at Reading, that would connect the points served by the RBMN (particularly Jim Thorpe, which often experiences traffic backups and parking shortages) with the rest of the East Coast’s bus and rail transit network (including Amtrak connections at Philadelphia). Muller said demand has been so great for his existing service that he hasn’t thought about connecting it with other services, and told me of his negative experiences in trying to partner with other companies. “When I’ve partnered, I’ve done all the work and not gotten any money,” he explained. I admire Muller’s can-do attitude and wish that more railroad managers, particularly of small railroads, emulated it. The true revival of passenger trains as a more integral part of the American transportation network will require more of this kind of unconventional thinking. I also believe that a truly interconnected travel network — the kind that most Europeans and the Japanese, among others, enjoy — will require cooperation between providers of common carrier services whose routes do or could connect. Railroad leadership, in other words, needs to find the right balance between independent entrepreneurialism and symbiotic collaboration.